Pretty self-explanatory. Just play a 100 games and this should unlock. It doesn't matter how long you last in a map. You can check your progress towards this achievement in the "Statistics" section of the main menu. In order to get this one, first I unlocked the Sports Car you get by mastering all 5 challenges. Then I found out that you can't get this achievement in Practice Mode, you have to do it in Survival. I tried to boost whenever there was a straight line and used the brakes to negotiate the narrow turns. I lost a bit of time here and there but still managed to get my lap time around 28 seconds so I would say it's easier than it looks. Pretty self-explanatory. There's a high probability this one will be the first achievement you get in this game. I got this one by reaching the time limit of 2 minutes on a map. I won't spoil what happens but it's easier to get this one when you reach that point. Just run over a frozen enemy, be it because you used some freeze bullets or a freezeshield. Pretty self-explanatory. This one will require some play time. You'll be awarded this achievement once you reach an hour of active playtime, i.e. actually playing the game on a map, not staring at the menus. This is a cumulative achievement. It will unlock once you reach a total of 20 laps on the Desert map. You need to make the rocket take off in the Launchsite map. To do this, you need either a police car crashing on it or a tank shooting at it. Just circle around it until either of those things happen. Surviving 120 seconds is pretty much the goal of the game. There's no easy way around that one. Just play the game, learn the maps and the effects of each items and maybe find a car that suits you. I used the default car quite a lot and the rickshaw because of its ability to perform very sharp turns. This is another cumulative achievement. Just play the game and it will pop up eventually. Pretty self-explanatory. I got it by playing the game normally in Survival. I'm a pretty bad aim so I did not manage to get that one as of yet. I assume it can be done in either Single Player or Multiplayer. You'll first encounter tanks in the Square map. You can either shoot them (2-3 shots with any ammo, only one with the Bomb ammo) or lure them into crashing in the environment, which is pretty easy to do. I got this achievement this way, it unlocked because one of the tanks crashed itself off screen. Pretty self-explanatory. As far as I know, zombies only appear in the Cemetery map, so you'll have to play that one over and over again until you reach that number of slayed zombies. I assume it's most probably quicker to do it in Multiplayer, since you have more people to run the zombies over. To get this one, I applied the following strategy: First, I take the checkpoint right above me when starting up and then I quickly crash my car in order to respawn. Then I take all the remaining checkpoints by proceeding clockwise in the maze: First the bottom corner, then the left corner and finally, the top corner. Obviously, the checkpoint in the tight spot should be the last one you take. Not much to say here. I got this one by being lucky with the game's physics engine and by spamming the bullet button as much as I could. Circling counter-clockwise on the brown floor also helped a bit. This one was pretty tricky. I found that the best way to beat the time was to circling close to the police cars while shooting 3 or 4 shots in front of you regularly. 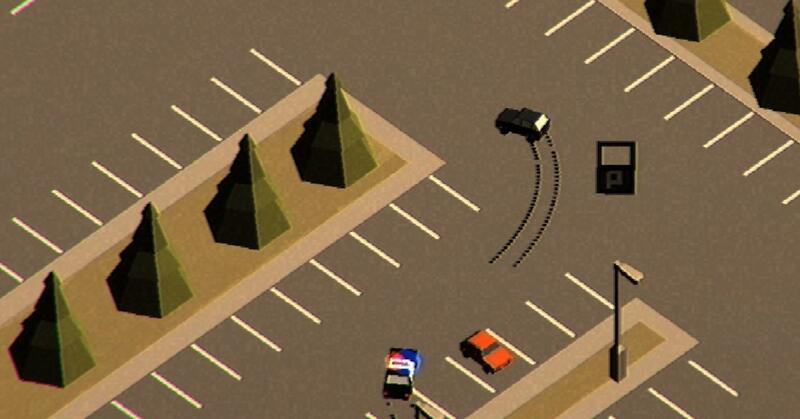 Hitting the police cars with your Amok bullets will make them proceed forward out of their initial place pretty fast. If you're doing this right, they will try and turn in order to hit you but they will be going too fast and will end up crashing into the police cars parked behind you. Rinse and repeat as fast as you can until there are no more police cars on the screen. This one is tough. Contrary to what a lot of people seem to think regarding this challenge, I personally do not think you have to boost your whole way through. I ended up getting it by having the most efficient driving ever, which was a combination of using the boost in every straight line I could and making the sharpest turns at each and every corner. Takes a bit of skill, practice and patience. This one is pretty much luck based. You'll have to wait for the game to give you the right combination of items to make it possible. I got it because the game gave me some Bomb ammo (first crate in front of the start) and a Wrecking Ball (inside the crate on the left, behind the remains of some wall). Once I got these, I made a sharp turn in front of the first tank on the left when you start and then I shot the three remaining tanks with my Bomb ammo, one bullet, one kill. Pretty much the same as the Single Player one, this time in multiplayer. You can check your progress towards this achievement in the "Statistics" section of the main menu. Don't need no guns to survive. Survive 120 seconds without shooting a bullet. Surprisingly, and just like with Original style, I wasn't able to trigger this one in Single Player. I finally unlocked it in Multiplayer. I haven't gotten that one as of yet but from what I understand, you need to play 40 consecutive Multiplayer games. Surprisingly, and just like with Don't need no guns to survive., I wasn't able to trigger this one in Single Player. I finally unlocked it in Multiplayer.